Proximal humeral neck fractures are also more generally known as proximal humerus fractures. Although some people refer to them as shoulder fractures, we prefer to avoid that term as there are many bones around the shoulder. Proximal humerus fractures are among the most common fractures seen by our Orthopaedic surgeons. They can occur in any age group, although they are most commonly due to a fall in older individuals. We pay particular attention to proximal humerus fractures occurring from relatively minor injuries in patients 50 years or older, as they may be a sign of osteoporosis. Patients are often seen first in the Emergency Room, where the diagnosis is made. The emergency room physician may attempt to reduce (or ‘set’) the fracture prior to immobilizing it a sling, collar/cuff or hanging arm cast. The purpose of all of forms of immobilization are to allow gravity to pull down on the elbow, which helps align the proximal humerus fracture while it is healing. 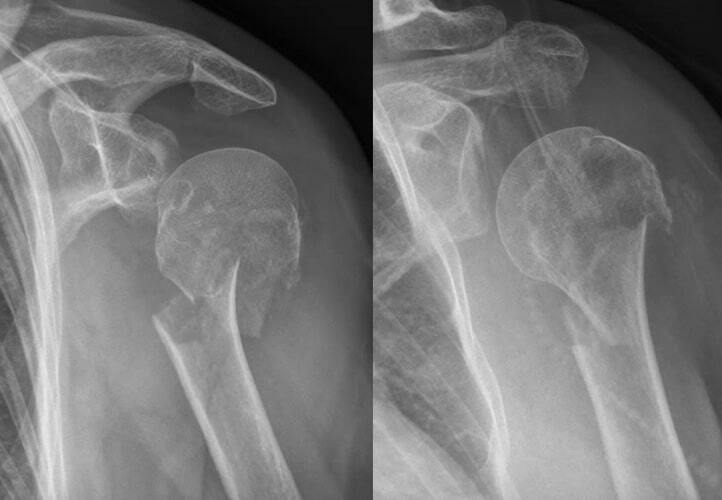 In contrast to many other fractures, it is not possible to ‘cast’ a proximal humerus fracture, nor is it necessary in this instance to allow for healing. 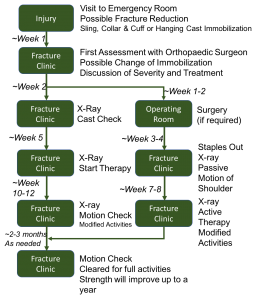 Patients are then referred to a fracture clinic where they are seen by an Orthopaedic surgeon. The X-rays obtained and the cause of the injury will help the surgeon determine how severe the proximal humerus fracture is. In general, 98-99% of all proximal humerus fractures can be managed without an operation. Although several surgeries are available to treat these fractures, clinical studies are increasingly showing that surgery is often unnecessary and comes with significant risk with little (if any) clinical benefit. The exceptions to this are severe fractures in young individuals (often due to high-energy or workplace injuries), or in instances with a proximal humerus fracture is associated with a dislocation of the glenohumeral (or shoulder) joint. Internal Fixation with Plates and Screws: The purpose of this is to better align the bones and hold them with stainless steel plates/screws while your body heals. It is important to note that surgery is not in itself designed to return someone back to function quicker. Instead, it is designed to hold the bones in a better position while your body heals the break. Shoulder Arthroplasty: Severe shoulder fractures that cannot be held with plates and screws may require a shoulder arthroplasty (or shoulder replacement). A shoulder arthroplasty is a metal prosthesis that replaces broken bones within your shoulder. It is used when your surgeon is unable to fix your bones with plates and screws. Recovery and timing of therapy will depend on the type of prosthesis used. No Surgery: Patients are followed at week 1 and/or week 2 at the discretion of surgeon. X-rays will be taken at each visit. Early X-rays assess alignment but cannot determine healing. It is important to note that the first two weeks following injury can be incredibly painful. Sleeping and finding a comfortable position can be challenging, even in a well-fitting sling. As pain subsides, we encourage elbow, wrist and finger range of motion to avoid stiffness. Pendular exercises (or ‘pot-stirrer exercises’) can begin at week 3 or 4. At 5-6 weeks following injury an X-ray is obtained to assess for healing of the fracture. Additional time in the sling may be required should the fracture not be fully healed. Once healed, we recommend physical therapy to regain motion and progressively build up strength. After Surgery: Patients are seen at 2 weeks post up for removal of staples. We encourage immediate elbow, wrist and finger range of motion exercises but no lifting weights beyond 1lb for 6 weeks. Shoulder range of motion will depend on the type of surgery performed. Regardless of surgery, physical therapy is started at 6 weeks post operatively with the short-term goal of regaining shoulder range of motion. All slings should be kept clean and dry. Swelling is common following an injury or fracture. To decrease swelling consider icing it 15 minutes at a time every 1-2 hours. Ice should be wrapped in a tea-towel to avoid frost-bite. Occasional numbness that resolves quickly is to be expected. Persistent numbness in the arm is not common and should be mentioned toyour physician. You may find it more comfortable to sleep in a reclining chair for the first 2-5 weeks following the injury. Ensure the chair is placed close to washrooms and away from any tripping hazards. Please note: this alone does not constitute as a formal referral to a physical therapy. As each injury is unique, the below may not apply to everyone. While in a sling: Work on active and active assisted range of motion of your fingers/thumb, wrist and elbow to prevent stiffness. As long as your elbow is close to your body, non-weight bearing exercises are safe to perform for the above joints. 3-4 weeks following injury: As pain subsides, you can begin to perform light pendular exercises. To do this, you let your arm hang and have gravity rotate your hand around. This allows for some motion through your shoulder without excessive stress on the fracture. 5-6 weeks following injury: Once your fracture is healed you will begin to wean the sling and start physical therapy. The goal is to regain 80% of your shoulder motion by 12 weeks post injury. 12 weeks post injury: Add in strengthening of the shoulder, with sport or job specific exercises as needed. At all times: Let pain be your guide. Excessive discomfort or therapist concern should prompt you to contact your Orthopaedic Surgeon or Family Physician. Shoulder fractures can cause significant stiffness and weakness around the shoulder. Depending on the severity, your treating physician will comment on your expected recovery. In general, we aim to return people to 80% of their previous function, with a goal of return to work before the 12-week mark. Wrist/Finger Stiffness: May require formal physical therapy over 6 months to resolve. Chance of finger/wrist stiffness can be greatly decreased by keeping both joints moving. Shoulder Stiffness and Weakness: Stiffness around the shoulder is to be expected. It can take upwards of a year to maximize gains in shoulder range of motion nd strength. Physical therapy and ongoing exercises are critical for recovery during this time. Complex Regional Pain Syndrome: a challenging adverse pain response associated with some fractures. Requires time, physical therapy and occasionally medications to treat. Please note: this information is designed to enhance the care provided to patients by the surgeons of Simcoe-Muskoka Orthopaedics. Medical and surgical management will differ on a case by case basis and should not be undertaken without guidance from a trained medical practitioner who assumes the responsibility for a given patient’s care. While each information package is peer reviewed, we cannot guarantee the absolute accuracy of this information nor its relevance to a patient’s specific medical situation.